Designed to make an impression, the Clementine Chair Cream is a contemporary classic. Sure to enhance a wide range of interior settings, the Clementine would make the perfect purchase. Cutting a striking silhouette, the popular crescent shaped seat arcs round the body, with both the seat and curving backrest padded for quality comfort. Upholstered in cool cream faux leather, this complements the frame beneath beautifully. The polished chrome of the central column is set to shine in many settings. 360 swivel delivers optimum mobility, whilst the protective underside of the circular base helps to minimise scuffs to flooring. 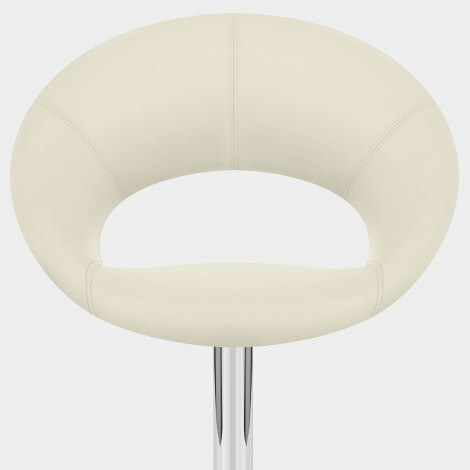 "They look real class and are so comfortable"
Comfy chair height stools that look and feel good quality, great value for money too. These stylish comfortable chairs are well made, easily assembled and are good value. Perfect - arrived in good time - simple and quick to assemble - amazing value for money! Excellent product, service, delivery and value for money. Great buy! Very impressed with these excellent quality chairs. They fit very neatly around my round table, and don't take up a lot of room when not in use.